If so, oh boy, is there a neat new resource you have got to check out. It’s an online index and ordering system for Tennessee Supreme Court case files. And while we can’t sit there in our bunny slippers at 3 a.m. and read the case files online, we can sit there and read about the cases and decide whether we want to order them — and even find out how much a particular case file will cost. And considering that these records were sitting in an attic covered in coal dust and utterly unusable just a few years ago, the fact that we have even this much access is nothing short of miraculous. Once stored in the attic of the Tennessee State Capitol building, the Supreme Court records came to the Library & Archives in dire need of restoration. Curled and brittle, covered in coal dust from the furnace pipes that fed into the Capitol’s storage space, the records were all but unusable. Our archival technical staff has worked tirelessly toward the preservation of these records for more than a decade. Staff members have meticulously cleaned off the dust and grime, carefully flattened and recorded the contents for more than 50,000 cases. • In 1847, in Washington County, the case of Walter Waterford, by next friend v. John Baker & Adam Waterford: “Walter Waterford, a described man of color, complains by Lewis Garner. W. Waterford belonged as a slave and was sold to A. Waterford (dec.), brother of W. Waterford. An agreement was made that once W. Waterford paid back the cost of the sale, he would be emancipated. A. Waterford benefited from his labor for years and W. Waterford believes he made back the sum required for his freedom years before. A. Waterford’s son, David, now holds administration on the deed; seeking injunction until funds determined”. Clicking on the Order a Copy button next to any file will tell you exactly how much it will cost to get a paper file sent by mail or PDF images sent by email. In the State v. Campbell Duggan case, for example, there are 11 pages and the cost to have it sent to me in New Jersey was $10. In the Coover v. Davenport case, there are 113 pages and the cost was $56.50. Seems a bit high until you consider the cost of a single trip to Tennessee… Puts the cost into perspective when you think of it that way. Not to mention when you think of the goodies… lots and lots of goodies… in these records. 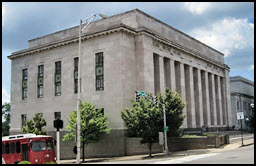 Image: Tennessee Supreme Court, Nashville; Thomas R. Machnitzki, via Wikimedia Commons CC-BY-3.0. Does this represent what we in Michigan would call “Michigan Supreme Court Records and Briefs”? What an achievement. Thanks for bringing it to our attention. Pretty much the equivalent, though I’m not sure if the briefs are in the case files in Tennessee or kept separately. Oh, goodie. This may be just what I need to find out what happened to Calvin. Even if it doesn’t, it’s going to be interesting just to get a feel for what kinds of things went on in Tennessee when my ancesters were there. Thanks for the great find, Judy. Thank you so much! My ancestors in TN include many members of the BAYLESS family. I have long heard about the freed slaves of Sarah Bayless and how they had sued to avoid being sent to Africa. Now I have some or all of that information. I have DL’d it and look forward to reading it later when I am offline. I was beginning to think I would never find that information. I also found some other BAYLESS items. Very nice!